It is oddly fitting that the birth of electromagnetism, and an entirely new direction in physics, started with the tiniest twitch of a compass needle. In the year 1820, Danish physicist Hans Christian Oersted (1777-1851) observed the twitch of said compass needle in the presence of an electric current, providing the first definite evidence of a link between electricity and magnetism that would set the tone for much of modern physics. The story of Oersted’s experiment is the stuff of physics legend, but like most legends it is often misremembered and exaggerated. Nevertheless, it is a fascinating piece of work and a piece of scientific history worth recounting. The early 1800s were an exciting time to be studying electricity. In 1800, Italian physicist Alessandro Volta developed the first chemical battery, known as the voltaic pile. Volta’s battery was inspired in part by the observations of Luigi Galvani, who in 1791 discovered that the muscles of dead frogs could be excited by electrical sparks¹. Some years earlier, in 1784, Charles-Augustin de Coulomb first quantified the force between electrical charges, discovering the inverse square law that is now known as Coulomb’s law. Evidence was piling up that many seemingly disparate phenomena in nature were connected. In addition to the “animal electricity” discovered by Galvani, Benjamin Franklin had postulated and demonstrated in the 1750s that lightning was a form of electricity with his invention of the lightning rod and a particularly infamous kite flight. Volta’s chemical battery showed that the field of chemistry also had connections to electricity. A number of isolated observations also suggested a connection between electricity and magnetism. Benjamin Franklin had magnetized needles by discharging electricity through them, and sailors had reported occasionally reported the reversal of polarity of compass needles after their ships were struck by lightning. Nevertheless, other experiments were inconclusive and many prominent scientists doubted that there was a connection. In 1807, Thomas Young (of the double slit experiment) wrote, “there is no reason to imagine any immediate connexion between magnetism and electricity, except that electricity affects the conducting powers of iron or steel for magnetism, in the same manner as heat or agitation”. In 1802, André-Marie Ampère declared² that he would “DEMONSTRATE that the electrical and magnetic phenomena are due to two different fluids which act independently of each other”. Hans Christian Oersted therefore entered into the study of electricity and magnetism at a time when the field was ready for a major discovery, and he was an ideal person to take up the challenge³. His father was a pharmacist, and Oersted developed an interest in science at a young age while working in his father’s shop. His early education came from self-study at home, which apparently served him quite well: he entered the University of Copenhagen in 1793 and excelled there, earning honors for papers on aesthetics and physics. He earned his doctorate in 1799 for a dissertation on the works of philosopher Immanuel Kant entitled, “The Architectonicks of Natural Metaphysics”. Oersted’s philosophical training would play a crucial role in his discovery of electromagnetism. In 1801 he received a travel scholarship that allowed him to spend several years traveling through Europe. While in Germany, he immersed himself in the philosophical circles and made the acquaintance of a number of German philosophers. Oersted seems to have been particularly influenced by the Naturphilosophie of Friedrich Wilhelm Joseph Schelling (1775-1854), and later in life Oersted would credit this philosophy for stimulating his discovery. “Naturphilosophie” would be considered a very alien concept to modern scientists. It rejected an empirical and mathematical view of the world as developed by luminaries such as Isaac Newton, and instead favored an intuitive approach to understanding nature. However, it also had an emphasis on understanding nature as a whole, and therefore somewhat naturally incorporated the idea that all the disparate phenomena observed in physics were all manifestations of a simpler fundamental set of laws. In a sense, this philosophy anticipated the “grand unified theory” of nature that physicists are working towards today. For the followers of Naturphilosophie, the idea that electricity and magnetism must be connected was a natural one. Also while in Germany, Oersted met Johann Wilhelm Ritter (1776-1810), a physicist and chemist and devotee of Naturphilosophie. Ritter was apparently played a bit fast and loose with the science: though he made a number of significant discoveries, just as many “discoveries” were found to be incorrect due to experimental errors. 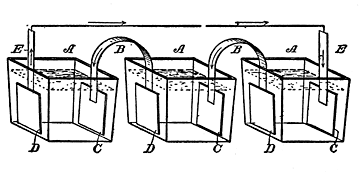 One of those errors was a claim that he could produce the electrolysis of water using magnets instead of an electric battery; in general, Ritter was a passionate believer in a link between electricity and magnetism. 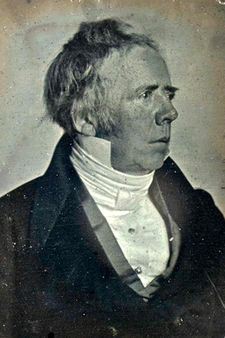 Oersted became a Professor at the University of Copenhagen in 1806, and brought with him the convictions borne of Ritter and Naturphilosophie. He did research on electricity and acoustics and at the same time grew the physics and chemistry programs of the university. In composing the lecture, in which he was to treat of the analogy between magnetism and electricity, he conjectured, that if it were possible to produce any magnetical effect by electricity, this could not be in the direction of the current, since this had been so often tried in vain, but that it must be produced by a lateral action. This was strictly connected with his other ideas; for he did not consider the transmission of electricity through a conductor as an uniform stream, but as a succession of interruptions and reestablishments of equilibrium, in such a manner, that the electrical powers in the current were not in quiet equilibrium, but in a state of continual conflict. As the luminous and heating effect of the electrical current, goes out in all directions from a conductor, which transmits a great quantity of electricity; so he thought it possible that the magnetical effect could likewise eradiate. The observations above recorded, of magnetical effects produced by lightning, in steel-needles not immediately struck, confirmed him in his opinion. He was nevertheless far from expecting a great magnetical effect of the galvanical pile; and still he supposed that a power, sufficient to make the conducting wire glowing, might be required. The plan of the first experiment was, to make the current of a little galvanic trough apparatus, commonly used in his lectures, pass through a very thin platina wire, which was placed over a compass covered with glass. The preparations for the experiments were made, but some accident having hindered him from trying it before the lecture, he intended to defer it to another opportunity; yet during the lecture, the probability of its success appeared stronger, so that he made the first experiment in the presence of the audience. The magnetical needle, though included in a box, was disturbed; but the effect was very feeble, and must, before its law was discovered, seem very irregular, the experiment made no strong impression on the audience. The wire from an electrical circuit is routed over the top of a compass needle which is, of course, pointing to magnetic north. When the switch is closed, current flows through the wire and the compass needle jitters slightly. It may appear strange, that the discoverer made no further experiments upon the subject during three months; he himself finds it difficult enough to conceive it; but the extreme feebleness and seeming confusion of the phenomena in the first experiment, the remembrance of the numerous errors committed upon this subject by earlier philosophers, and particularly by his friend Ritter, the claim such a matter has to be treated with earnest attention, may have determined him to delay his researches to a more convenient time. We’ve already mentioned that Ritter’s researches, which Oersted partly participated in, were plagued with unreproducible results. Oersted seems to have approached similar studies with more caution. He picked up his studies again in July of 1820, and by July 21 of that year he had already drafted a paper announcing the discovery to the world. The original paper appeared in Latin, titled, “Experimenta Circa Effectum Conflictus Electrici in Acum Magneticam,” and was distributed to scientific societies throughout Europe. It was quickly translated into French, Italian, German and, of course, English; the English version, “Experiments on the effect of a current of electricity on the magnetic needle,” appeared in the Annals of Philosophy5, and this version we will discuss in detail. The first experiments respecting the subject which I mean at present to explain, were made by me last winter, while lecturing on electricity, galvanism, and magnetism, in the University. It seemed demonstrated by these experiments that the magnetic needle was moved from its position by the galvanic apparatus, but that the galvanic circle must be complete, and not open, which last method was tried in vain some years ago by very celebrated philosophers. But as these experiments were made with a feeble apparatus, and were not, therefore, sufficiently conclusive, considering the importance of the subject, I associated myself with my friend Esmarck to repeat and extend them by means of a very powerful galvanic battery, provided by us in common. Mr. Wleugel, a Knight of the Order of Danneborg, and at the head of the Pilots, was present at, and assisted in, the experiments. There were present likewise Mr. Hauch, a man very well skilled in the Natural Sciences, Mr. Reinhardt, Professor of Natural History, Mr. Jacobsen, Professor of Medicine, and that very skilful chemist, Mr. Zeise, Doctor of Philosophy. I had often made experiments by myself; but every fact which I had observed was repeated in the presence of these gentlemen. Aside from explaining the background of his discovery, Oersted points out that his initial apparatus was insufficient to make a conclusive measurement. It is notable that he emphasizes the presence of witnesses to his research; perhaps he worried that nobody would believe him? The galvanic apparatus which we employed consists of twenty copper troughs, the length and height of each of which was 12 inches; but the breadth scarcely exceeded 2 1/2 inches. Every trough is supplied with two plates of copper, so bent that they could carry a copper rod, which supports the zinc plate in the water of the next trough. The water of the troughs contained one-sixtieth of its weight of sulphuric acid, and an equal quantity of nitric acid. The portion of each zinc plate sunk in the water is a square whose side is about 10 inches in length. A smaller apparatus will answer provided it be strong enough to heat a metallic wire red hot. The plates (C) are plates of copper, while the plates (D) are zinc; more details on the chemistry behind such batteries can be found here. The observation that the battery must be strong enough to make the wire “red hot” suggests that the battery must provide a large electrical current, i.e. flow of electricity. The opposite ends of the galvanic battery were joined by a metallic wire, which, for shortness sake, we shall call the uniting conductor, or the uniting wire. To the effect which takes place in this conductor and in the surrounding space, we shall give the name of the conflict of electricity. Let the straight part of this wire be placed horizontally above the magnetic needle, properly suspended, and parallel to it. If necessary, the uniting wire is bent so as to assume a proper position for the experiment. Things being in this state, the needle will be moved, and the end of it next the negative side of the battery will go westward. 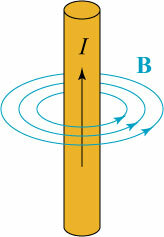 If the distance of the uniting wire does not exceed three-quarters of an inch from the needle, the declination of the needle makes an angle of about 45°. If the distance is increased, the angle diminishes proportionally. The declination likewise varies with the power of the battery. 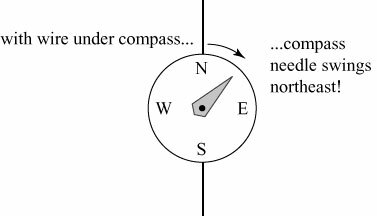 As depicted in the second part of the figure above, the compass needle swings to a position roughly northwest, provided the wire is close to the compass. 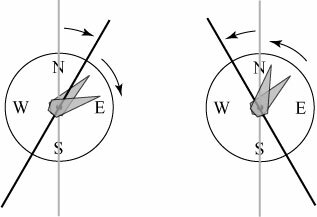 Moving the compass away from the wire decreases the angle — the strength of the effect decreases with distance — and lowering the battery power decreases the angle — the effect is proportional to the electric current. The uniting wire may change its place, either towards the east or west, provided it continue parallel to the needle, without any other change of the effect than in respect to its quantity. Hence the effect cannot be ascribed to attraction; for the same pole of the magnetic needle, which approaches the uniting wire, while placed on its east side, ought to recede from it when on the west side, if these declinations depended on attractions and repulsions. The uniting conductor may consist of several wires, or metallic ribbons, connected together. The nature of the metal does not alter the effect, but merely the quantity. Wires of platinum, gold, silver, brass, iron, ribbons of lead and tin, a mass of mercury, were employed with equal success. The conductor does not lose its effect, though interrupted by water, unless the interruption amounts to several inches in length. There are a number of important observations here. Keeping the compass below the wire, but moving it east or west, does not change the overall effect, other than the decrease apparently due to distance. The needle feels a pull to the west on either side. He also notes that the type of conductor used does not alter the nature of the effect, merely the “quantity”. Different conductors have different electrical resistances, and will naturally pull a stronger or weaker current. The effect of the uniting wire passes to the needle through glass, metals, wood, water, resin, stoneware, stones; for it is not taken away by interposing plates of glass, metal or wood. Even glass, metal, and wood, interposed at once, do not destroy, and indeed scarcely diminish the effect. The disc of the electrophorus, plates of porphyry, a stoneware vessel, even filled with water, were interposed with the same result. We found the effects unchanged when the needle was included in a brass box filled with water. It is needless to observe that the transmission of effects through all these matters has never before been observed in electricity and galvanism. The effects, therefore, which take place in the conflict of electricity are very different from the effects of either of the electricities. Oersted attempted to block the magnetic effect by placing a variety of magnetic materials between the compass and the wire, and found that the materials hardly reduced the effect. It was well-known in Oersted’s time that electricity could be “screened” and reduced by matter; these tests demonstrated that the new effect was not an ordinary electrical one. If the uniting wire be placed in a horizontal plane under the magnetic needle, all the effects are the same as when it is above the needle, only they are in an opposite direction; for the pole of the magnetic needle next the negative end of the battery declines to the east. That these facts may be the more easily retained, we may use this formula––the pole above which the negative electricity enters is turned to the west; under which, to the east. 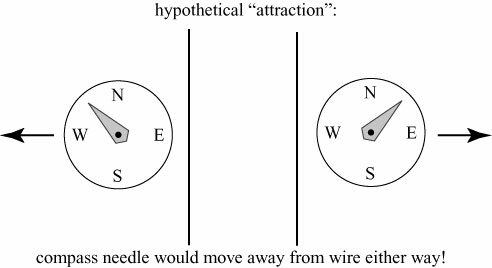 If the uniting wire is so turned in a horizontal plane as to form a gradually increasing angle with the magnetic meridian, the declination of the needle increases, if the motion of the wire is towards the place of the disturbed needle; but it diminishes if the wire moves further from that place. 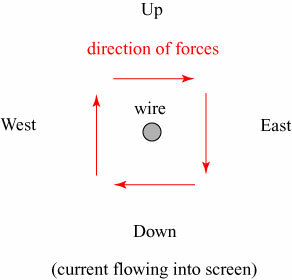 When the uniting wire is situated in the same horizontal plane in which the needle moves by means of the counterpoise, and parallel to it, no declination is produced either to the east or west ; but an inclination takes place, so that the pole, next which the negative electricity enters the wire, is depressed when the wire is situated on the west side,and elevated when situated on the east side. When the compass is placed directly to the west of the wire, the tip of the needle gets pulled upward; when the compass is placed directly to the east, the tip gets pulled downward. In this picture, is the electrical current, flowing upwards, and is the magnetic field. An explanation of the relationship between magnetic fields and forces is rather complicated (it is partially discussed here, and then here), but suffice to say for now that a permanent magnet will tend to line up with the magnetic field lines, its north pole pointing along the direction of the field. It is sufficiently evident from the preceding facts that the electric conflict is not confined to the conductor, but dispersed pretty widely in the circumjacent space. From the preceding facts we may likewise infer that this conflict performs circles; for without this condition it seems impossible that the one part of the uniting wire, when placed below the magnetic pole, should drive it towards the east, and when placed above it towards the west; for it is the nature of a circle that the motions in opposite parts should have an opposite direction. 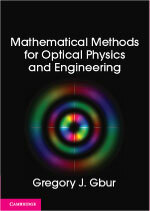 Besides, a motion in circles, joined with a progressive motion, according to the length of the conductor, ought to form a conchoidal or spiral line; but this, unless I am mistaken, contributes nothing to explain the phenomena hitherto observed. The latter sentence is worth addressing. Oersted notes that, if a force is present along the direction of the wire in addition to one circulating it, the lines of force will form spirals rather than circles. This is in fact what happens, as the Earth’s magnetic field provides a force pointing towards magnetic north, which in the experimental setup is parallel to the wire. The presence of the Earth’s magnetic field is also the reason that the compass needle points northeast or northwest in the preliminary measurements, instead of east and west: the Earth’s field still exerts a northward pull. All the effects on the north pole above-mentioned are easily understood by supposing that negative electricity moves in a spiral line bent towards the right, and propels the north pole, but does not act on the south pole. The effects on the south pole are explained in a similar manner, if we ascribe to positive electricity a contrary motion and power of acting on the south pole, but not upon the north. 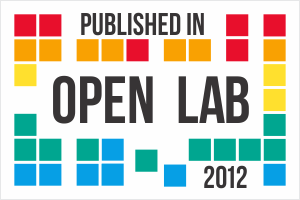 The agreement of this law with nature will be better seen by a repetition of the experiments than by a long explanation. The mode of judging of the experiments will be much facilitated if the course of the electricities in the uniting wire be pointed out by marks or figures. It is a little difficult to understand exactly what Oersted is proposing here. He seems to have believed that the positive charges produce a right-handed spiral electric field, and the negative moving charges produce a left-handed spiral electric field, and that these positive/negative fields only act on the south/north poles, respectively. This is what Oersted referred to as the “conflict of electricity”, and is apparently inspired by the strong dualism built into the German Naturphilosophie: nature was viewed as being a clash of opposites. If you find this difficult to understand, you’re in good company. Some of the most brilliant scientists of the time — including André-Marie Ampère, Michael Faraday, and Joseph Fourier — tried to make sense of Oersted’s theory and failed. Ampère, in fact, very quickly developed his own mathematical theory of electromagnetism that worked so well that Oersted’s own musings were soon neglected. Oersted did not suffer, however, either in his career or his research. He was elected a foreign member of the Royal Swedish Academy of Sciences in 1822, and in 1829 he founded a center of learning that would later become the Technical University of Denmark. He continued his electrical researches, but his next monumental achievement would be in chemistry: in 1825 he was the first to chemically isolate aluminum. Oersted’s achievement truly changed the course of scientific history. He had demonstrated that magnetism could be produced by electricity, which left many researchers to wonder if electricity could also be produced by magnetism. Many tried and failed to make the connection, but at last in 1831 Michael Faraday showed that a changing magnetic field could produce an electric field, closing in a sense the “theoretical circuit”. Faraday’s discovery in turn led to James Clerk Maxwell‘s completion of the fundamental theory of electromagnetism, and the realization that light is an electromagnetic wave. The discovery and understanding of electromagnetic waves led to radar, television, the laser, fiber-optic communications and then the internet that you’re reading this post on. Quite a remarkable outcome, considering it started with the tiniest twitch of a compass needle! 1. One of Galvani’s nephews, Giovanni Aldini, performed electrical experiments on an executed murderer in 1803 that were so dramatic that onlookers feared that the man had been brought back to life. 2. This latter declaration would prove particularly ironic, as Ampère would later lay the theoretical foundations for electromagnetism. 3. My discussion of Oersted and the history of his discovery comes from three sources: R.C. Stauffer, “Speculation and Experiment in the Background of Oersted’s Discovery of Electromagnetism,” ISIS 48 (1957), 33; K.Jelved, A.D. Jackson, O. Knudson, Selected Scientific Works of Hans Christian Oersted (Princeton University Press, Princeton, 1998); and of course Wikipedia. 4. From an article on “Thermo-electricity” written by Oersted for volume 18 of The Edinburgh Encyclopaedia, published in 1830. 5. H.C. Oersted, “Experiments on the effect of a current of electricity on the magnetic needle,” Annals of Philosophy 16 (1820), 273-276. The importance of public demonstrations and witnesses in early science, and particularly the science of electricity, is discussed in Simon Schaffer’s “Self Evidence,” Critical Inquiry vol. 18, no. 2 (Winter 1992), pp. 327-362: http://www.jstor.org/pss/1343787, as well as in Steven Shapin’s _A Social History of Truth_ ( 1994, Univ. of Chicago Press). An interesting blog post about the work of Schaffer, Shapin, Galison, and others about conceptual change in the notion of scientific objectivity, shifting from reliance on people to reliance on instruments, is Will Thomas’ “Schaffer on Bodies, Evidence, and Objectivity” at the Ether Wave Propaganda blog. Thanks for the links! I’ll have to give them a look. Thanks! It is quite amazing, when you think of it — Oersted not only performed an experiment for the first time in front of a lecture hall, and it worked, but it was one of the biggest discoveries in all of physics! Thank you for the interesting story. It was so well and clearly written that I actually stole it and used it in class (I’m a physycs high school teacher here in Italy)!